Last week, I was excited to spend the day in San Francisco’s historic Castro Theater, listening to an incredible list of speakers at the Lesbians Who Tech Summit. I’ve been to many industry events where the talks end up being a snoozefest, but LWT had such engaging speakers, I couldn’t get enough. The topics ranged from the Mars 2020 mission to freezing your eggs and then to the robots Amazon uses to fulfill orders in its warehouses. This was my first LWT event and I know I’ll be back for more. Two of the speakers really stood out to me. Tiffany Dockery got a standing ovation for her talk on “How to Overcome Imposter Syndrome,” discussing what it’s like being a black female product manager at Amazon who’s openly gay. And Tania Katan’s talk, “It was never a dress,” aimed at discussing the disparity of women in tech and the inequality that women face in many areas of life. 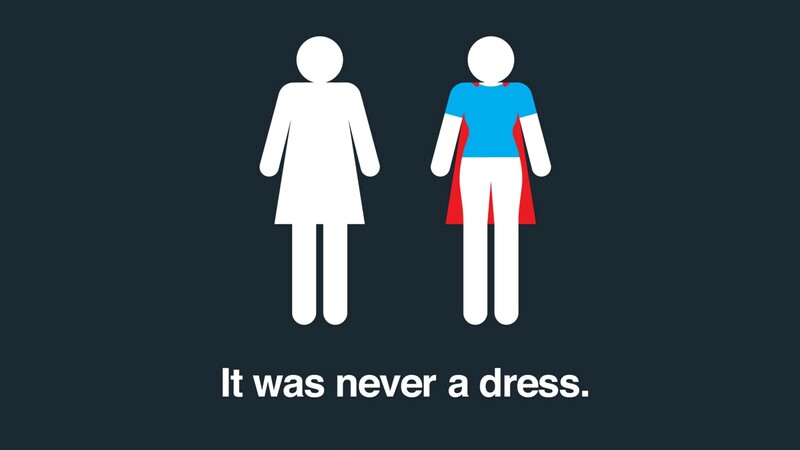 Her ‘aha moment’ came when she approached a bathroom door and saw the women’s bathroom sign not as a woman in a dress, but a woman in a cape, as the superhero that she is. Beyond having amazing speakers and emcees, the audience participation and energy was fantastic. Everyone seemed engaged with the content, and very few people were glued to their laptops or phones except to take notes. The event was high energy from the get-go and we were invigorated by the impromptu dance parties between sessions. It seemed like everyone was there to learn something and was captivated by the event. After a morning of listening to top-notch speakers and shaking my booty in the dance sessions, it was time for me to jump onstage with four other women for the entrepreneur pitch competition. I’m not a huge fan of public speaking (understatement of the year), but this audience of 1600 people seemed less terrifying than I imagined. I knew if I ended up running off stage puking from nervousness that at least I’d get an understanding hug or two. I was the last to pitch and I connected with the audience by walking onstage and asking if everyone was as stoked as I was to be in a room filled with techie queers. [YEAH!] 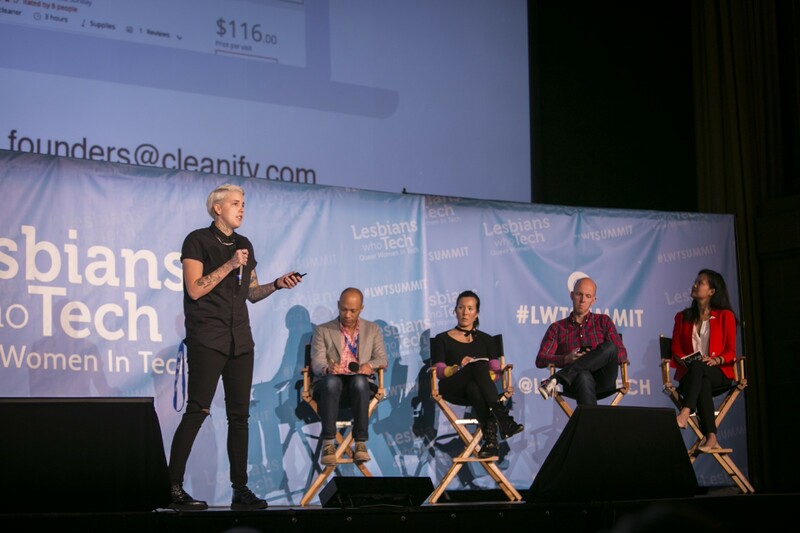 Then I explained what Cleanify, my start-up, does, and how we connect customers to established local cleaning service providers while providing additional marketing and operational services to those providers. 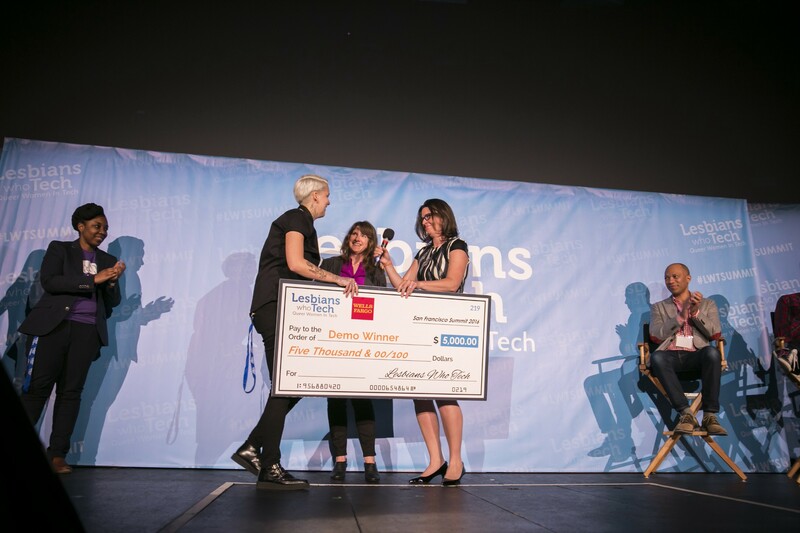 The next thing I knew, I was being handed a giant check for $5,000, having won the pitch contest! I felt like a superstar, getting hugs from people left and right, and answering questions about Cleanify. This being my first novelty check, I wasn’t quite sure what to do with it. One of the women who handed it over teased me that I could simply walk up to a bank teller with the check, but of course it was missing my name and was conspicuously larger than a normal sized check. It’s surprisingly light, and I ended up carrying it around with me for hours on Friday night, making lots of new friends. Thank you to the fabulous team behind Lesbians Who Tech! I can’t wait to go to another event. Lesbians Who Tech is a community of queer women in and around tech (and the people who love them).